The recent experiment with ordering fertile Penedesenca eggs (with Welsummer egg bonus) was a bit of a wash. 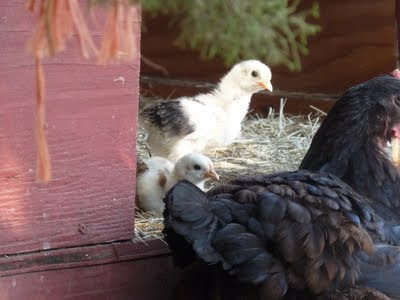 It may simply have been too hot: the broody hens would nest hop, and then forget their original clutch. Eventually, two eggs DID hatch: both Welsummers. Molly the Jersey Giant hatched one, and Cinnamon the Cubalaya hatched one. I had to transfer Cinnamon's chick to Molly, as Cinnamon wasn't "getting" that the new chick was hers to care for. She kept pecking the heck out of it, and the chick was starting to limp. Molly accepted the new chick, and she's being an excellent mother to both (pic on right). Cinnamon continued to be broody for almost two weeks after the hatching. Make your own nose pore strips: youtube video. I haven't used pore strips in years, but this looks super easy to make. Might have to try it again! A frugal dinner meal plan from Green, Blue, Brown. Thinking about trying this as well. Makes fantastic use of a whole chicken and rotating ingredients. A quick guide on how to make herbal tinctures with both fresh and dry plant matter. I've the beginnings of a medicinal herb garden, and will definitely use this technique. Never been one much for herbal teas - just give me a few drops of tincture, thank you very much. A tool to blow out eggs, so you can use the intact empty eggshells for crafts. The tool also lets you blow out the egg with only one hole, so there's more continuous shell to paint. I've done everything from using a bicycle pump to lung power, and let me tell you, none have worked all that great. Goose eggs are big, strong, and great for crafts, sometimes going for $2.00 an egg. Nice way to re-purpose shells for those eggs that are past their freshness prime.